Alex and Ashlynn ready for a new school year. I can't believe that they are in the 5th and 3rd grade. They are growing up so fast. The girls tried out soccer this spring. 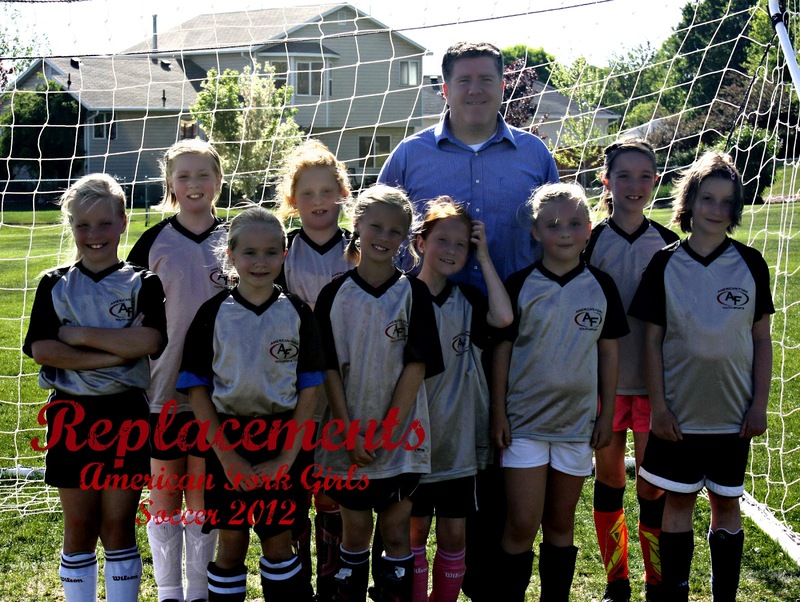 We learned all about cleats, shin guards and how to kick a ball. There is still a lot I do not understand when it comes to soccer. Hopefully I will get a better handle on things this coming fall. The summer is coming to a close really fast. I decided that we needed to get Ashlynn's birthday party in before there were no more days left. She decided to go bowling with her friends for her party. When we went to get decorations she said she wanted a blue and green birthday party. So that is what she got. Lots of blue and lots of green. The one thing she really wanted was to wear a crown. We got this one that she wore all day including during bowling as well as every day after. Alex has asked me every year for a very long time if she can do the science fair. This year I thought I would be the good mom and said yes. At first, Alex had told me they could do it together but when she brought home the information it said only those in the same grade level could be partners. Ashlynn really wanted to do it so we ended up doing 2 projects. Alex wanted to do something with natural dyes made from fruits and vegetables. We tested 2 fruits and 2 vegetables to find which one made the darkest red dye. Ashlynn went around the ward testing people memories to see whether they were better at remembering by sight or sound. All of it was a lot of work but I know they felt proud to be apart of something. They each received the standard participation ribbon and certificate but they also both received a Honorable Mention ribbon. 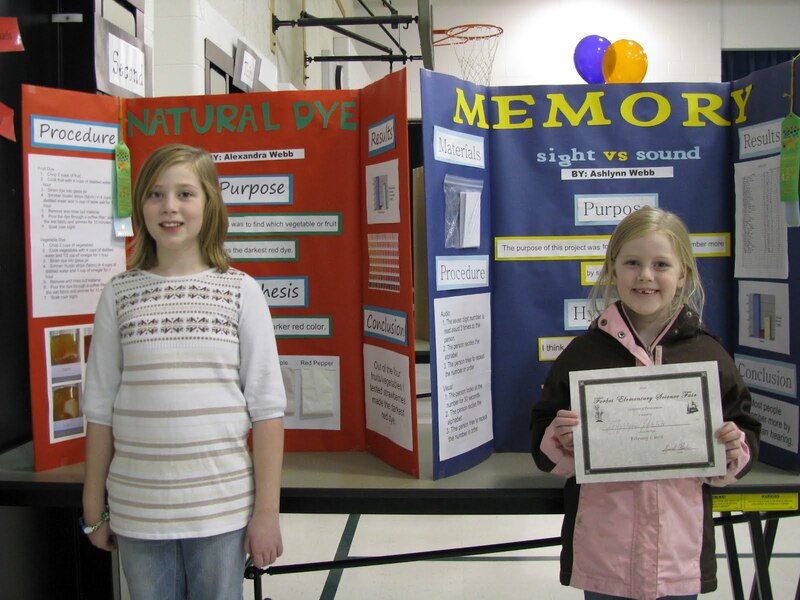 Next year will be mandatory for Alex to participate so we will be continuing with the science fair for the next 4 years. Over the Christmas break our neighbor remodeled our bathroom. We had to leave the house for a few days because it is our only bathroom and we would not be able to use it during that time. A whole bunch of things happened during that time that made this process very difficult but we got through it. We have a beautiful new bathroom that we get to enjoy. My only regret is that I have no before pictures to share because it was really a last minute decision. But just trust me that before it was horrible. Some of the upgrades and changes are: the heating vent was moved, new vanity, new vanity lighting, new sink, new toilet, new tile, new hotel-style curtain rod, new towel and toilet paper holders, new mirror, new paint, new air fan, 4 electrical outlets instead of one...I am sure I am forgetting something. I love all my new additions and am now just looking forward to the day that we can replace all the linens as well. Happy Halloween everyone! This year Alex really wanted to be Princess Tamina from The Prince of Persia. 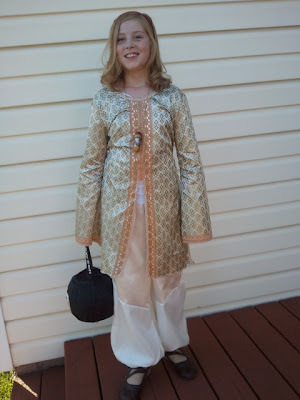 We got her costume and the sand necklace online. 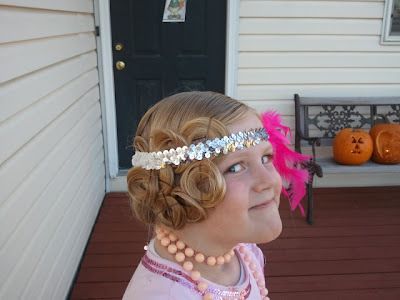 After looking through the different costumes online Ashlynn decided she wanted to be a Flapper. When asked what a flapper was she would answer "Someone from the olden days." She cracks me up. I think she just thought it was the cutest costume. Keri made her dress and I did her hair. It only took about 40 minutes to do and a lot of telling her to stop complaining:) We ate dinner and trick or treated with the Clawsons again this year. I don't think the kids would like it if we didn't get together with the Clawson's. 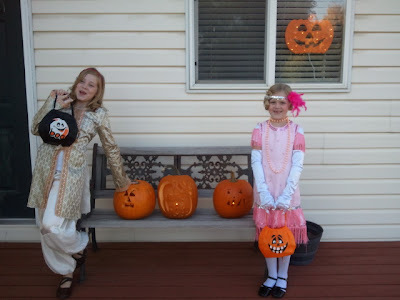 We racked up a lot of candy and had a ton of fun!